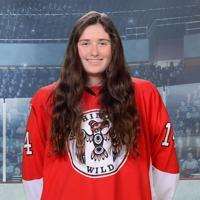 Ryanne Mix of the Washington Wild 19UAA team committed to the NCAA D3 Women's Hockey Team at Castleton University in Vermont, where she plans to major in biology while playing for the Castleton Spartans. Mix join WWFHA in the 2014 - 2015 season as a billet player from Richland, Washington – playing hockey for the 19UAA team, staying with a host family, and attending school at Juanita High School (Lake Washington School District) in Kirkland, WA. Ryanne held down the blue line for 4 seasons as one of the top defenders for the Washington Wild. She spent with one season playing for the California Wave AAA team before returning to the Washington Wild for her final season so that she could prepare for college play. Ryanne joins the Castleton Spartans, who play in the New England Hockey Conference (NEHC). New head coach Ashley Salerno improved on the team’s 2016 - 2017 overall record of 8-14-4. The Spartans just earned 3rd place in their 14th season as an NCAA D3 team, with a 13-13-1 record. This year the Spartans advanced to the league semi-final where they lost to the #2 seed UMass-Boston 2-1. The Castleton women’s hockey program is made up of players from all over the world including England, Sweden, and Canada, as well as New England, Florida, and North Carolina. Ryanne will be the second Washington State player; WWFHA alumna Ally Brandland attended Castleton and graduated 2 years ago. We spoke to Ryanne and her mom Debbie about their experiences with WWFHA and the Washington Wild, and about her future plans. What do you plan to study at Castleton? Ryanne: I have been accepted into the biology program. I plan to get a Bachelors in Biology. Their Biology program is very good and I am looking forward to starting classes in the fall. What are you most excited about or looking forward to at Castleton? Ryanne: I like the location of Castleton. Castleton is located in the mid-west of the state with a small town and mountains close by. I am also excited about how small Castleton is with about 2000 students. I liked the feel of the campus--it’s a small campus but it seems bigger than it actually is. What are you most excited about or looking forward to about playing for the Castleton Women’s Hockey team? Ryanne: I am excited to play at the NCAA D3 level. Playing college hockey has always been my dream. I’m looking forward to being a student athlete. I’m excited to be playing against new teams and some of my old teammates. It also shows all the younger WWFHA girls that Seattle may not be known for hockey, but we can still be competitive and are able to play at the college level. Tell us about the billeting experience from a player and parent perspective. Ryanne: This is my fourth year billeting and I have enjoyed every single year. Being away from home was not easy during high school and I was very lucky to have such great billets during my hockey career. For a family to take you in as one of their own is not easy and I’m grateful the Whites, Millers, Izadis and Payeurs. They are all amazing families, and they treated me like their own daughter. Thank you to everyone for allowing me this opportunity to play girls hockey these last four years away from home. I wouldn’t be here without your generosity. Debbie: Ryanne has billeted away from home for four years in a row. Each year we have been fortunate enough to meet amazing billet families, starting with the Whites, the Millers, the Izadi’s in Long Beach, and our final family, the Payeurs in Kirkland. Each family has in some way helped shape Ryanne into the person she is today. She has learned to embrace each family and become like a family member. Living with each family has been a learning experience in maturity, responsibility and accountability. All of these traits are important to be successful in high school and will be pertinent for Ryanne to be successful in college as well as life. Ryanne has been enrolled in three different high schools the last four years and she has adapted remarkably well. Not an easy task! But she did it and has done it well--again more life experiences that will help her down the road. I hope that Ryanne has had a positive impact on each billet family she has lived with. I would like to thank every family who opened their home to Ryanne these last four years--we could not have done it without you willing to take on a teenage female hockey player and the responsibility that goes along with it. Ryanne, Kendall and I thank you for helping her achieve her goal of playing college hockey. It has been a remarkable experience for our family to be a part of the larger WWFHA family. What do you like about the WWFHA organization as a player and parent? 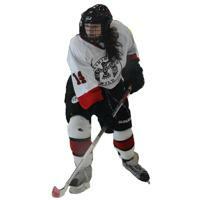 Ryanne: WWFHA has great staff that help any girl to reach her goals, whatever they may be. I wouldn’t be where I am if it wasn’t for the WWFHA staff and coaches. Debbie: WWFHA is truly all about empowering girls through hockey. There is no hidden agenda, it’s about the girls and helping them succeed in hockey and life. I appreciate the board staying on course and not wavering from their mission and not letting outside obstacles stop them. I have been around a few other associations in past years and WWFHA is so incredibly organized and positive, and every year the association keeps growing. That speaks volumes. What do you like about the Washington Wild team, the players, and the coaches as a player and parent? Ryanne: My team gets along very well and we are all close to each other. We all support each other when we need it. Our chemistry off the ice helps us perform better on the ice. Coach Shaun has been instrumental in helping develop my skills over the years in both individual skill and team play. Debbie: Coach Miller is a huge asset for the Wild. He has really taught the girls to be better players individually and as a team. Every year we have played with the Wild the team improves immensely from the beginning of hockey to the end of the season. Shaun knows how to get them to peak at the right time. What would you say to players and parents in WWFHA who have the goal and dream of playing college hockey? Ryanne: Playing college hockey is possible if you work hard. It’s important to stay focused and get good grades. It won’t be easy but it is worth it to know that you will be going to college and to achieve your dream. I’m excited about this new chapter in my life and I hope the younger girls can experience this, too. Debbie: From a parent standpoint, it’s not about being on the most successful team but rather looking at the coaching and the organization as a whole. If you have a coach who every year makes your daughter a better player and the team better as a whole, that’s all you really need. You can get the visibility by participating in showcase tournaments-- Beantown and Rush hockey are two good ones to consider as well as summer camps. The Wild are also working their way up into AAA tournaments which is great. During the season, work on improving individual skills and team play. Beantown and Rush hockey are where Ryanne received the most interest. It can be very frustrating trying to reach out to coaches when they really can’t correspond with you, but just keep at it and things will come together. WWFHA can help reach out to coaches for recommendations, too, which was a huge benefit for Ryanne. I don’t think we would have gotten to where we are without Zoe’s [Harris] assistance and Shaun Miller’s coaching. We didn’t start talking to schools until the summer before Ryanne’s senior year. I think that’s a pretty normal timeline for D3 and ACHA. So don’t get too worried if things aren’t happening as fast as you would like them. It will all come together.